A year ago while admiring the mid-day buzz around some profusely blooming chive blossoms in my garden I noticed that none of the pollinators were honey bees. 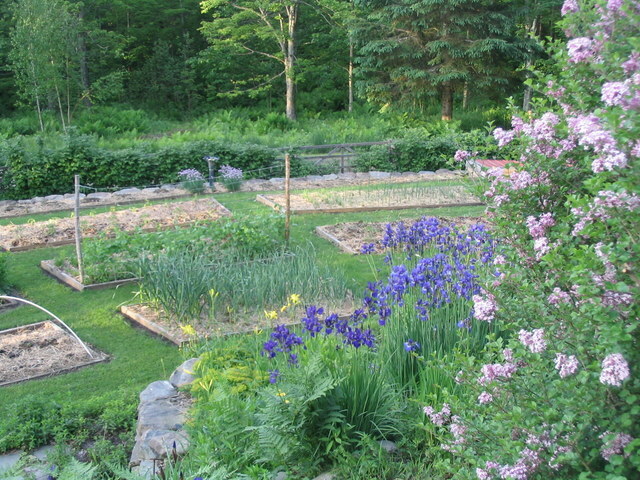 Instead, a multi-cultural throng of pollinating insects ranging in size from the big fuzzy bumble bees to tiny and medium sized bees and wasps occupied the air space around the plants. I interpreted this to be a demonstration that there can be plenty of native pollinators who will perform the pollination necessary for our gardens and orchards if there is sufficient food and habitat available for them. Meanwhile across the road,my neighbor Tracy was installing her first bee hive. She had spent the past several months diligently studying beekeeping from books,workshops and websites and was finally beginning the new adventure. I had considered attempting bee keeping myself but ultimately couldn’t deal with what seemed an overwhelming learning curve. So when Tracy took on the challenge I was delighted to watch and cheer from the sidelines. The very next day,visiting my chive blossoms,buzzing filled the air once again,but this time it was all honey bees! I don’t know where the wild pollinators went,but presumably they returned to the native plants that they are adapted for. The flowering plants in our gardens originate from far flung corners of the earth but my yard also offers not-so-tidy,weedy edges around the clearing that hopefully provide plenty of food for the full range of pollinators,wild and domestic. Honey bees of course are greatly beloved by us humans for their production of copious amounts of honey. 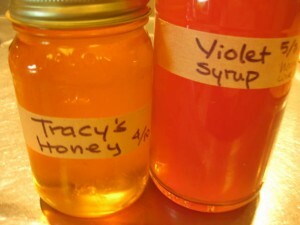 So I was thrilled when Tracy gave me a pint of honey from her first “crop”last week. Having witnessed her bees in my garden, it was a treat to taste the fruit of their labors,bringing to mind all the flowers of spring,summer and fall, combined in one sweet concentrated spoonful. 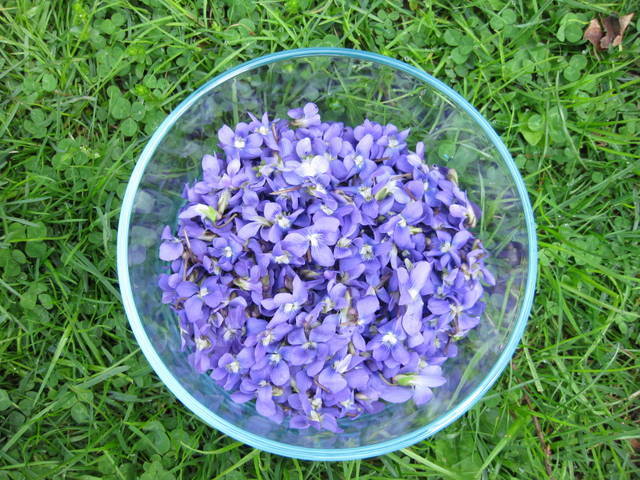 Tracy’s honey and the annual flush of wild violets in one of our weedy edges,inspired me to make a batch of v iolet syrup. It’s a nice addition to seltzer or other drinks if you want a delicate,sweet taste of purple blossoms. 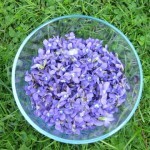 Traditional recipes involve cooking the violet blossom tea with sugar but I prefer to make it with honey and to barely cook it at all to retain as much of nutrients as possible. It’s worth considering the sugar-based approach too as it results in a clearer,prettier syrup and cooking it to concentrate the sugars,makes the product last longer,especially if lemon is added. sterilize bottle(s),fill with the hot syrup and refrigerate after it comes to room temperature. Keeps for several months. Savor the taste of violet blossoms with your iced tea! Thank you for this great recipe. I look forward to giving it a try next year. I came to this post from your 2010 Harvest post. whoah this blog is great i love reading your articles. Keep up the great work! You know,lots of people are searching around for this information,you could aid them greatly.